I knew the top was just about at the current snow line, so wearing four layers and with a balaclava for the descent I set off. Col de Cuvery is above Bellegarde and part of the same massif as Col de Richmond, Col de la Biche and Le Grand Colombier. Almost 15 kilometres long and over 800 metres of ascent, it’s a pretty decent climb. I knew the top was just about at the current snow line, so wearing four layers and with a balaclava for the descent I set off. The Climb starts in Bellegarde – but I started a little higher in Vouvray since it avoids the busier first couple of kilometres. As with all my recent Jura climbs, its a lovely super-quiet road through mountain forests. 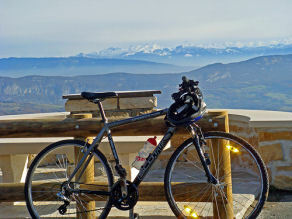 Although a little cloudy, the snow covered Alps were in full view throughout the climb. At the top is the Plateau de Retord with signed cross-country skiing routes as well as several signed mountain bike routes. Despite the ice off the road, I had planned to investigate the trails up top, but my rear chain ring broke loose – yikes. Luckily I could cruise the entire way home without pedaling. 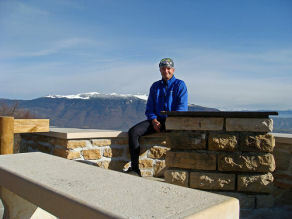 Previous Article2008 Tour de France Preview Stage 16 – The Highest Road in Europe? Next Article How does altitude affect power output? that sounds like a great challenge you have mastered so far in 2007! All the best for the last couple of weeks! Thanks for all the insights and maps of your climbs. I am pretty sure that this is an extremely useful resource for us triathletes! We are not climbing as much as you do, but still we do it to get in shape!